Lewis just needs 5pts to win the WDC for 2018. Pretty much. Vettel has to win BUT if Lewis comes in 7th or better then the WDC is his. If Vettel comes in second, Lewis wins regardless unless Lewis DNFs. so the quali will be interesting as it of right now it shows 90% rain....and we ALL know how good we are in the wet....NOT!!!! Lewis needs P7, that's all. Even if Vettel wins all the remaining races. Kimi will test the new floor, Vettel running the older spec. weather forecasts are usually wrong though, we've seen it time and time again this season. "Kimi Raikkonen has surpassed Mika Haikkanen as most successfull Finnish driver"
I am pretty sure Mika has won 2 WDC, compared to Kimi's one. yes, that only refers to race wins. It should be base on no. of championships. Seb needs a good race regardless to regain some credibility and put an end to this rough streak. On the Mercedes side, Bottas needs one too as people start to think he is not worthy of that seat. Seb frustrated over team radio saying its a waist running like this. Obviously Ferrari running aggressive setups. I would very much like to see how Ocon and Bottas would do head-to-head. Last edited by Rob; 26th October 2018 at 20:53. New floor going on Sebs car. 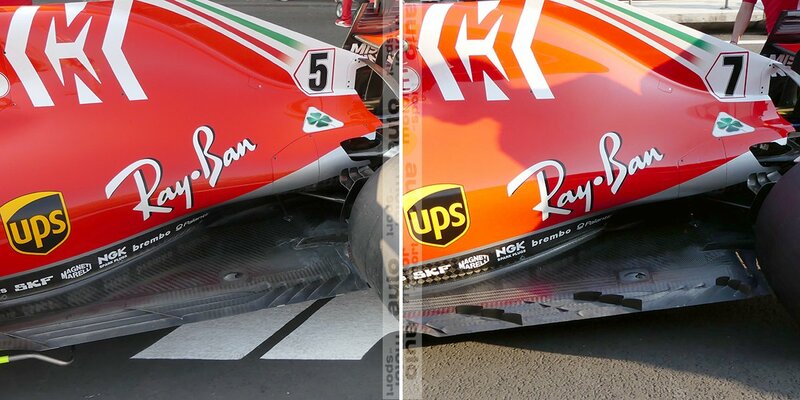 Kimi now gets the old floor. Di Resta is pretty good, but they need to sack David Croft. And Herbert is as annoying as Croft so him too. Jumping into conclusions already? Haven't learned anything from the last race it seems. Last edited by Rob; 26th October 2018 at 20:56.